Pininfarinas announcement late last year that it would cease contract manufacturing by the end of 2011 could leave Austrias Magna Steyr as the only large-scale contract manufacturer in Europe. In any supplier sector, its not good to be the last one standing. The worst choice for a carmaker is to have just one choice, a high-ranking European automotive executive told Automotive News Europe on condition of anonymity. When choosing suppliers, automakers want to be able to find the right fit for their business. Contract manufacturing is no different. Some coachbuilders specialize in refining an automakers design, others are better at bending sheet metal, others have the structure to efficiently handle runs of 20,000 to 40,000 specialty vehicles. But niche models dont bring coachbuilders the profits they once did. And the increasing flexibility of automakers assembly plants means that more car companies are bringing the work in-house. As a result, coachbuilders such as Pininfarina, Karmann of Germany and Valmet of Finland are either exiting contract manufacturing, are on the verge of doing so due to a lack of orders, or plan to concentrate more on making electric vehicles. For example, Pininfarina will produce electric cars under its own name starting late next year. In late 2008, Heuliez was taken over by Argentum Motors, Indias largest independent contract manufacturer. But the French coachbuilders only production contract, the Opel/Vauxhall Tigra Twin Top, ends this year. Even worse off is Carrozzeria Bertone of Italy, which ceased volume production at the end of 2005 and has yet to find a buyer. That basically leaves Magna Steyr as the only choice for contract manufacturing in Europe. Automakers dont like this, and, privately, Magna Steyr executives arent thrilled either. Life has not been easy for Magna Steyr recently. 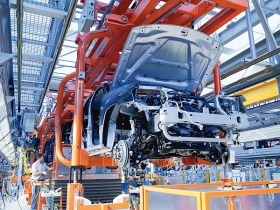 Production at its plant in Graz, Austria, fell to less than 150,000 units last year, almost 100,000 units below the 248,059 record the company set in 2006. If this number looks worryingly low, consider that most of Magna Steyrs ailing competitors each built about one-tenth of the Austrian companys declining volume. And Magna Steyr executives say 2006 was a freak abnormality in a business plan aimed at much lower volumes. Magna Steyr looks poised for a rebound. This year, it will begin making the Aston Martin Rapide, and Astons upcoming Lagonda relaunch likely will be built in Graz as well. Next year, Magna Steyr will add the Peugeot 308 RC Z coupe and Minis first SUV. In 2012, it will begin production of the replacements to the Porsche Boxster and Cayman. 4. A highly competitive engineering department, which not only develops cars to be captively built in Graz, but also engineers vehicles that automakers will build in their own plants. 5. Vertical integration with other Magna International subsidiaries, from dies to seats, from transmission components to door hinges. This permits a quicker time to market and keeps costs down. But the real bottom line is that there just isnt enough business to go around because automakers are now flexible enough to bring limited-run production in-house. Hopefully, the other European contract manufacturers will survive the current downturn and flourish again. It is sad to see long-established companies leave the business and watch their skilled and experienced workers lose their jobs. To survive, struggling coachbuilders could go back to their roots and build runs of custom-designed models of no more than a few hundred units. They could even go back to making one-off models for wealthy collectors. Pininfarina and Zagato successfully did so in recent years. At the same time, contract manufacturers should be wary of an all-out bet on electric cars. The watered-down pending EU legislation on carbon dioxide emissions will delay the true demand for such vehicles until 2020.